I have been asked on the blogger to look at tarot for Andre Bryant who disappeared in 1989. Looking at his date of birth he was, just a few weeks old before he disappeared and his mother killed. This first card for Andre is not that surprising given the situation. The world card shows that this child travelled on the day of his disappearance and could have 'emigrated' into a completely different area or country for that matter. The Fact that this is the world card shows one cycle of his life coming to an end and as we can only really look to the Ace or the Beginning of the Major Arcana once more for the circle of life, we would get to the Fool which shows him starting out his life's journey again. He looks to have a completely new life. Uncannily this card has number 21 on it and as I have opened this page it shows that he would be 21 now and that is a genuine coincidence. The world distinctly tells us about a change of residence and locality. The world does tells us about 'physical concerns' and this might indicate the harrowing ordeal of the mother. The Judgement card previous to this card can show some health concerns and possible need for hospital treatment but whether that is connected to Andre or his mother is difficult to say. 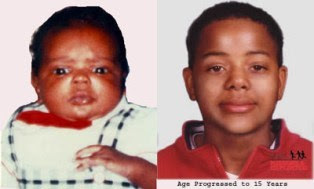 One thing is that someone 'came back from the past' to take this child so it would appear that whatever occurred would be connected to someone the child had already been linked with or had been in his company. Asking tarot where is this boy today I am being given the High Priestess and this card gives us initials B and J which could indicate a place where the child might be or initials of persons that he may be with. The next card is the Empress so that is a mother figure nurturing and often linked to a family of three. This is of course very open ended. The High Priestess is known for secrets and on the High Priestess is a scroll with written words on it but the story of the text is not finnished. This is not an adoption card particularly and certainly adoption has been mentioned - but it could apply to that because if there is a document with 'some details missing' its a possible indication of the childs details written down with a secret attached. I honestly think it is hard to pick a country or place for this child and the transportation of him so I would lean towards authorities conclusions that he could have been filtered out into another family and even more especially so with the Empress card next up. There are no obvious signs of 'death cards' here unless he died with the mother, but Im not truly thinking that as it does,nt feel 'right'. Two women do know where he went and I do think they are already mentioned as part of the story to do with the mother. Looking at the B and the J on the card it may be somewhere even in the country but a good clue would be where wheat and pomegranates are grown. There are also 12 stars on the Empress whether that is useful information or not. But lush greenery and ripe fields of wheat do enter this card. There is also a 'rose' connection here and there may be a 'blonde' mother in the picture. The Empress actually holds an EAGLE in her hand therefore its quite possible that the child would be in a place represented by an Eagle. Therefore the world card can show transportation within the same country but perhaps a different county. Im assuming the 'father' of the child has been ruled out????? The High Priestess shows that the entire scenario of this child is one of 'mystery'and things going on under the surface, hidden agendas but the tree of life stands behind the High Priestess which is another reason why I would like to be optimistic about Andre. If Andre is alive today I really do feel everything is in the past and he should just be left to live his life as I have a Yes BUT...type of feeling on that question I just feel like he is,nt with his real family and think about the consequences of that. This is the card I get when asking whether this child will be found. It seems to be 'fought off' but it is never out of the question. The next card shows swiftness in the 8 of wands so whether it would be swiftly put off should any enquiries be made I am not certain or whether in fact highlighting his case might bring something to the surface. A child who survives and gets transported into another area or family do get curious about themselves so everything is possible. Andre disappeared from Brooklyn and if there is any possibility he did not survive ( not seen yet in tarot) then the B in the High Priestess would suggest he is still in the same state. I think he is a gorgeous little boy and whatever his fate is in life I send love and support to him. Tarot cannot be considered 100 per cent accurate and all trends are over past present and future. There are no guarantees that it can give every detail so please look to other sources for confirmations of known facts. No news anywhere!! It is very important to keep this little chap profiles. Please let me know if you hear anything for him. 12 Dec 2013 - BROOKLYN (PIX11) - Timothy Bryant turned 49 years old this year ... and the infant, Andre, left their apartment in Bushwick on March 29, 1989.